Just because a kitchen is small doesn’t mean it can’t be functional. You just need to know how to maximize your space and get creative when it comes to cabinets and storage. Here are a few easy, expert tips for saving space in your kitchen. Instead of decorating blank wall space with artwork, use it to hang pots, pans, ladles, spatulas, and other kitchen accessories. Not only will this free up space in your cabinets and on your countertops, but it will also make oft-used items easy to access. If your kitchen has a door, it’s likely taking up precious space. Instead of letting that empty area go to waste, use an over-the-door storage hanger or rack to create a shelf. These are excellent for storing small items such as spices, olive oil, and tea. 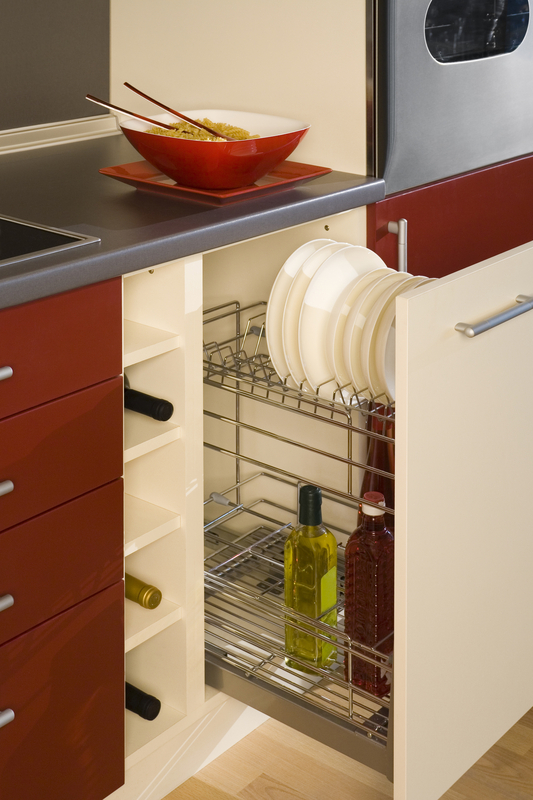 Sliding shelves are ideal for small kitchens because they maximize space by storing items vertically. For instance, a sliding pantry keeps all of your items right at your fingertips rather than hidden in the back of a cluttered cabinet. You can also free up countertop space by creating a pull-out spice rack or by tucking small appliances into siding shelves and drawers. Take advantage of the empty space under your cabinets by using it to hang mugs and wine glasses. In addition to enhancing your storage space, this trick can also add character to your kitchen by showing off some of your favorite glassware and mugs. The top of the fridge is another space that’s often wasted in a small kitchen. It can be used to store all kinds of items, from cereal boxes, pancake mix, and other dry goods to small appliances, such as coffeemakers and blenders. If you’re looking for creative ways to save space in your kitchen, the experts at Valley Design Center can help. For more than 30 years, this NYC-based home remodeling center has served as a one-stop-shop for home improvement projects, including kitchen remodeling, bathroom remodeling, custom cabinet installation, flooring installation, and more. Dedicated to the art of design and quality workmanship, they carry a wide selection of premium home enhancements in their showroom and are authorized dealers of both Kraftmaid® and Toto® products. Check out their website for kitchen organization ideas, and call (212) 832-4200 to schedule a consultation today.